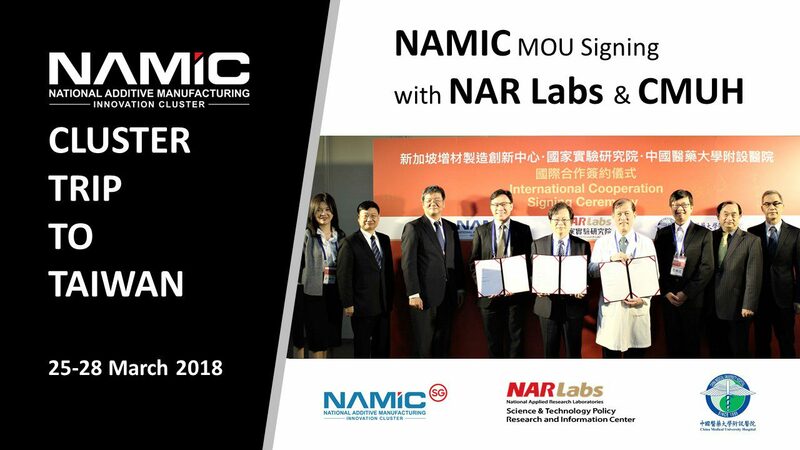 Taiwan’s National Laboratory Research Labs (NAR Labs) and China Medical University Hospital (CMUH) have come together to establish a strategic partnership with the National Additive Manufacturing Innovation Cluster (NAMIC). This is the second international collaboration initiative from NAMIC. The first one was established in October 2017 with Shanghai Additive Manufacturing Association (SAMA) and Shanghai Additive Manufacturing Innovation Centre (SAMIC). The three parties held an international cooperation signing ceremony on 27th March to jointly announce that they will collaborate on a broad range of 3D printing initiatives focused on bio-medical applications, in the areas of education, research, translation, and commercialization. This is part of the NAMIC Cluster Trip to Taiwan from 25 to 28 March 2018.